This fine looking villa has particularly good access located just outside the village in the now protected area of Bedar due to its outstanding natural beauty. A gated, private drive leads down to the house where you will find parking for a number of vehicles, from here a front courtyard with mature planting guides you to the main entrance to the property. A traditional wooden door opens into a spacious entrance hall, this delightful area features bespoke iron work banisters and slit windows. Double doors from here lead into the wonderful double height living/dining room, this bright and spacious space is flooded with light by the 4 sets of double doors to the front and rear. The views through the valley and down to the coast are fantastic from here and the room also includes a highly efficient multi fuel fire. Situated off this room you will find the beautifully finished, farm house style kitchen finished with a wooden work surface which features a large amount of storage and high quality integral appliances. The kitchen also accommodates a breakfast table and separate utility area. Also located from the entrance hall on the ground floor is the magnificent and sizable master bedroom featuring a large amount of fitted wardrobe space, double doors to the terrace and pool area and a good sized en-suite bathroom with double sink. The first of the guest bedrooms is also situated on the ground floor and includes fitted wardrobes and double doors to the terrace. The family bathroom is located opposite this room. A flight of rounded marble stairs guide you up from the entrance hall to the stunning main guest bedroom, this large room includes fitted wardrobes and doors out to a splendid terrace, this spacious area is where the best of the fabulous vistas can be appreciated. The bedroom also includes an en-suite bathroom. A further flight of marble stairs lead down from the entrance hall to the significant under-build, split into two areas, the space could be used for multiple uses including further accommodation, home office, gym , hobby room or home cinema. Outside this beautiful villa you will find the off shaped private swimming pool with plenty of space around it to relax whilst taking in the views. Above the pool is a terrace planted with a fine mix of trees and shrubs and located off the living room is another wonderful terrace perfect for dining and entertaining. 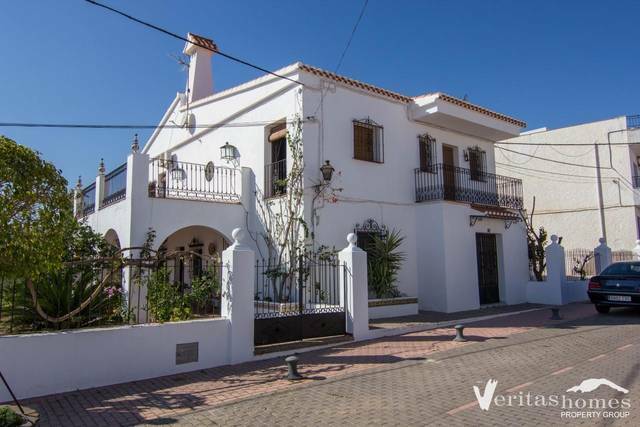 This great property sits on a plot of land of 10,000m2 made up of various terraces and mountainside which includes part of the historic water system. The villa also includes full gas central heating, partial air conditioning, satellite television, internet and full alarm system with CCTV.